Interesting fact, did you know that bone broth is high in collagen, protein, amino acids and minerals? How about the know fact that it also aids in muscle repair, improving gut health and reducing joint and other pains, all while fueling the body? That’s why Kettle & Fire Bone Broth is the best broth out there and why I love it. (Disclosure) I was so excited when my box of Kettle & Fire Bone Broth showed up at my door, for me to try and share my thoughts with you. How do they make this delicious broth? Well it all starts with organic 100% grass fed beef or chicken bones, that’s right bones, which they get from small family farms who raise their animals without any added hormones and antibiotics. Then they combine the premium ingredients with filtered water into steel kettles, say what? Weird right? Then the mixture is cooked for 20-24 hours at 130 degrees Fahrenheit; this provides enough time for the marrow, collagen and amino acids to soak into the broth. Next they then combine the highest collagen content bones with only organic vegetables, sea salt, and herbs. This means no artificial ingredients, no preservatives and no additives. They then package it while it’s hot in an “aseptic” vacuum environment so there are zero pathogens in the box or in the packaging area. This means no spoilage and a 2 year shelf life ( Amazing right?) Also their packaging is recyclable, sustainable, and made with natural materials so it doesn’t hurt of affect the environment. In all my 46 years of life it never dawned on me to drink bone broth as a healthy alternative to things like coffee, tea, cocoa, etc. The only time I was ever told to drink any kind of broth was before my colonoscopy. And for that, nothing I was told to drink was appealing. But, after learning how good it is for me to consume bone broth it is a new favorite drink of mine. There are mornings I replace a cup of coffee for some Kettle & Fire Bone Broth. I also enjoy a cup a few nights a week before bed. My favorite is the chicken… YUM! Aside from enjoying a cup of bone broth almost daily, I also love cooking with it. I use the beef broth instead of cooking oil when I fry or saute veggies or meats. Using bone broth helps add flavor to all my cooking, along with collagen, protein, amino acids and minerals that cooking oil doesn’t have. Win Win for me! I made a yummy chicken noodle soup last week with my chicken bone broth. It was kinda a “throw in this and that” recipe. It had chicken (breast), cauliflower, broccoli, carrots, and edamame noodles all swimming in the amazing Kettle & Fire Bone Broth. Let’s just say it was a huge hit! 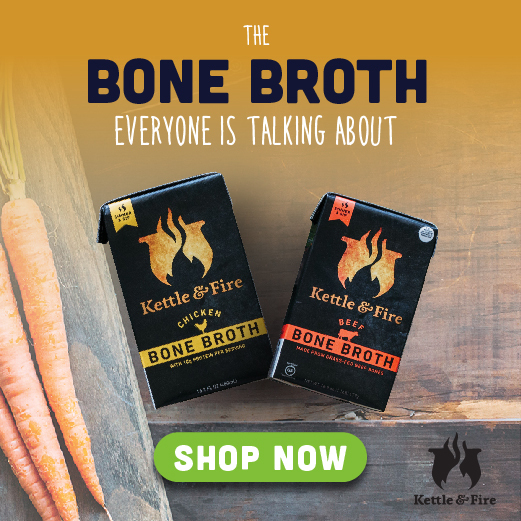 If you are looking to add a new bone broth to your shopping list, keep Kettle & Fire in mind. I have heard so many good things about bone broth, but have not tried consuming it on a consistent basis. This chicken noodle soup looks amazing! Thanks for sharing! I didn’t know there was such a thing as Bone Broth. Can’t wait to try it.